For all you travellers seeking to broaden your horizons, to jet off to places warm and exotic, latitudinally below our temperate island, we’d be fibbing if we said we weren’t just a little envious. I mean, yes; April has been kind to us here in the United Kingdom, and some of us even managed to get some sun. But the allure of the tropics, the excitement of new experiences; sometimes we forget about the health risks, and leave thinking about it to the last minute. So what’s the big deal about Malaria? I grew up in East Africa and, for me; the hype was something of an enigma. Naturally, I enjoyed what I always believed was the perfect climate; the seemingly endless days of sunshine; never “too hot” and never properly cold either, the occasional stormy period to make you appreciate the sun even more. Consequently, when I first came to Europe and watched people preparing to visit my homeland or countries nearby, visiting doctors and purchasing what seemed to be entirely unnecessary cocktails of tablets and lotions, I was amused. To me it was just home, beautiful, bountiful home. Today, with a greater understanding of the disease that comes from research and a little more experience – the importance of preparation and prevention for those that need it the most is not lost on me. After all, it is estimated that over 3 billion people are at risk of being susceptible to the Malaria. So we have prepared a handy little guide that will allow you to spend your time away unperturbed by a particularly powerful and pestilential parasite; Plasmodium A.K.A the bug that causes Malaria. Malaria is a life-threatening disease that claimed the lives of over half a million people in 2013. The symptoms of the disease appear over a week after the bite from the infected mosquito and include chills, vomiting, fever and other flu like symptoms. If left untreated, symptoms can progress and cause death. Firstly, be prepared. Research is your friend. Find out whether your destination is in an affected area. You can find out if you are at risk at the Fit For Travel website or you can call Instant e-Care Online Doctor & Pharmacy where the Pharmacist will be able to help you determine if you need malaria tablets, the malaria tablets most suited to you. Secondly, read up on how your can avoid bites. In both cases, advice is available from Instant e-Care Online Doctor & Pharmacy. Your choice of clothing is important; the less skin is exposed the fewer bites you will suffer. But who wants to wander about in the tropical heat wearing a nun’s habit? Probably not many people. So, use insect repellent. Available as sprays or lotions, it’s worth investing in enough to last you through your trip. Antimalarial treatments must be started before you make your trip because your body needs to build up its immunity. Common side effects of the drugs mimic those of the disease; headaches, nausea and vomiting. How soon before your trip you need to start will depend on the treatment that you choose. Malarone is the most popular anti-malarial option and one of its key advantages is that you only need to start taking it two days before you leave for your journeys and must continue taking the required dose until you’ve been back from the region in question for seven days. Additionally, those that use this treatment report fewer side effects than most other antimalarial treatments. Malarone is available at a lower cost under the label Generic Malarone. Doxycycline is the lowest cost malaria tablets available, with the same time advantage as Malarone in that one only needs to start two days before your trip. Unlike Malarone, the treatment must be taken for four weeks after your return from the affected region. A disadvantage is that users of this treatment experience extra sensitivity to sunlight and are therefore advised to wear sunscreen (factor 30 or higher) and protective clothing. Lariam is unique in that a dose is required only once a week. It is necessary to begin the treatment with Lariam ten days before departure and to carry on with it for four weeks after your return. An added side effect is Insomnia. All these treatments are continuous and therefore their success is contingent upon your completing the dose as per instructions. It is advisable to go over this with a doctor or pharmacist before you start the treatment. Now that you have the facts, we hope that you can enjoy your time away safe in the knowledge that you are protected. We look forward to receiving one of those smug “Wish you were here” postcards letting us know that Malaria is definitely not on the cards for you. Find out more about Aggie at Instant e-Care’s Health & Wellness Care Centre or visit Instant e-Care Online Doctor & Pharmacy for more information. Malaria Fact Sheet. The World Health Organisation. (April 2015). Imagine your prescription delivered to you, at home or the office. All without the need to book an appointment, having to see a doctor face-to-face or waiting in line at a local clinic or pharmacy. Sounds great doesn’t it? 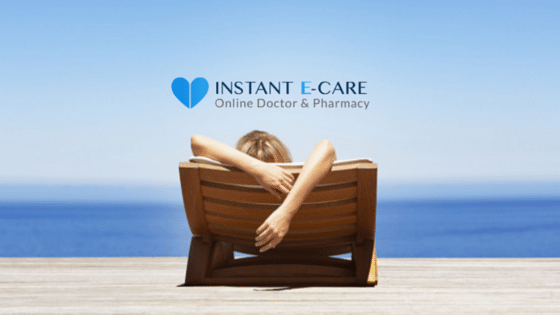 As part of the new wave of healthcare services shifting online, Instant e-Care announces the launch of a fully regulated Online Doctor & Pharmacy service. Instant e-Care understands the demands of the modern day woman, and that is why it has female focused health, travel, sexual and general clinics. It is the go-to for simple, fast and convenient prescription treatments without any of the hassle. If you need the treatment and you are healthy enough to take it safely, it will be delivered to you. It gets even better, for a limited period they are offering 10% off all treatments! There are no hidden costs, no doctor or private prescription fee and the “Low Price Guarantee” ensures treatments are cheaper than Boots, Lloyds or Superdrug. With simple re-order feature for registered customers, repeat prescriptions are made easy. Life is complicated enough. In a world that is becoming increasingly demanding, here at Instant e-Care we work around your busy lifestyle by replacing traditional, time-consuming methods with a more convenient online platform. Instant e-Care offers an initial range of over 14 popular lifestyle treatments; from Asthma, Anti-Malarial tablets, and Migraine to the more personal conditions such as Cystitis, Period Delay, Emergency Contraception and many more. Instant e-Care was founded on a vision of helping people with busy lives, and encourages the movement towards the future of digital healthcare online. It is a fully approved service regulated by The General Pharmaceutical Council (GPhC) with the registration number 1124966. Developed on the ethos that patient needs should come before anything else. 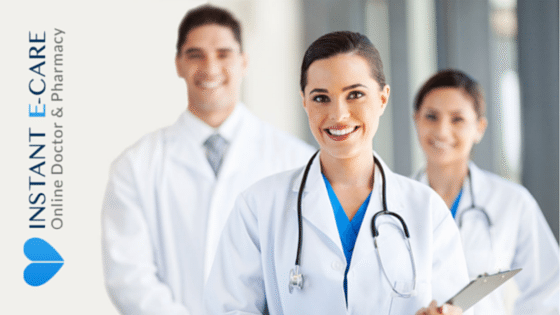 Instant e-Care understands the often time-consuming and sensitive nature of addressing personal medical issues, which comes as part of face-to-face consultations. With this in mind Instant e-Care has taken your user experience to a convenient online platform. The service is professional; catering for popular conditions and is designed to fulfill specific, sensitive and confidential patient needs in a discreet manner, at competitive prices. Instant e-Care is actively engaging patients and customers though social media, to create a more accessible and user-friendly service, you can find them regularly posting on Twitter, Facebook and Google Plus.